This state park (Faver-Dykes, south of St. Augustine) has a lovely fishing dock. At least, that is what it is called. I think a better label would be “observation deck.” We observed at least one gator, a few birds, a lot of mosquitoes, but no fish. Nary a nibble, both times we tried fishing from it. Ah, well. We next tried the fishing pier in Flagler Beach. Nice pier; lots of people using it. But few catching anything. Jim caught a couple of small whiting, not big enough to filet. And one young man caught a shark, which he landed right by us. The shark put up quite a fight. 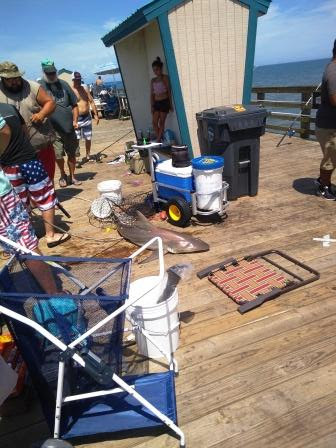 Despite the fishing pier’s rule against shark fishing (you can’t help it if you catch one, but you need to release it), the young fisherman was intent on landing the shark and getting a picture taken. That would have been OK, except that to haul it up to the pier, he had to use a gaff, which tore into the shark’s torso. I doubt that shark survived the ordeal. 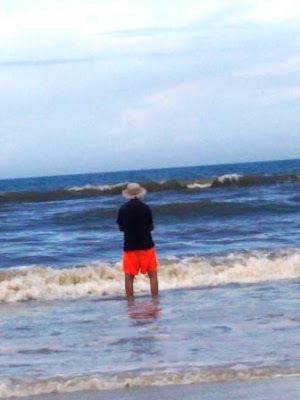 The best times to fish are when the tides are either coming in or going out. (Yes, we were at the park’s dock at the right time, as well as the Flagler Beach Fishing Pier.) 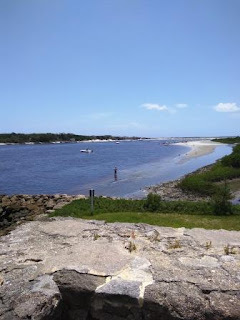 So, yesterday afternoon we went to the ocean around the Matanzas River Bridge on A1A. We were told that that was the area where many people surf fish. We found a good place to park, found our way down the embankment and out toward a point where fishing generally should be good. The tide was, indeed, coming in. Fast. So fast that after about 20 minutes we suddenly realized that we needed to pack up and move, else we would be wading through water to get back to the car! As we packed up, another fisherman advised us that fishing was generally pretty good down the beach a bit (probably about a quarter mile). Instead of heading home, we repositioned and starting dipping our lines again. Obviously, our attention was on the ocean to the east of us, but we after getting set up, we casually looked over our shoulder to the west and saw very dark skies. Checking the phone’s weather app, we saw that a storm was heading our way…maybe. It might hit us; it might not. This morning, we went back to the same spot on the ocean as the tide was heading out. Jim does the casting; I was watching the lines. I suddenly saw one of the lines bend. The action did not look like it was caused by the waves or current. Was there a fish on it? I decided to reel in the line to take a look. I cranked and cranked. Something heavy was on the end—or the line was snagged on some rocks. I finally handed the pole over to Jim, who continued to reel it in. What did we catch? 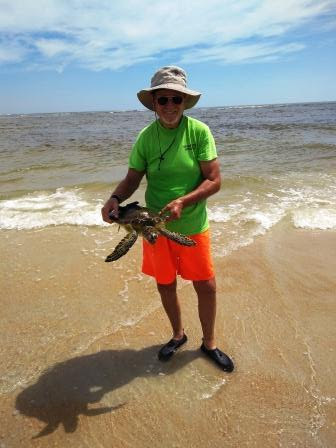 A sea turtle. No, it did not bite the hook. The poor baby got its fin snagged in the line. Jim hauled it in, untangled the line, and let it go. As the tide kept going out, it was necessary to wade out into the ocean to cast into the deeper areas where fish might be lurking. I wasn’t too successful wading. Every time I waded into the water, the sand (much like quick sand) sucked me in.Literally. I finally gave up. Jim didn’t, however. He took a pole and waded out quite a distance. 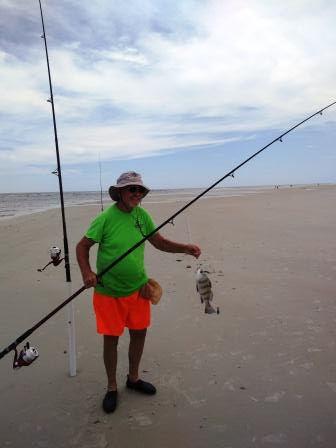 He finally caught a black drum. Unfortunately it was about an inch or so too small. So where does that leave us? A great time, but no fish. Fortunately, I brought plenty of food for dinner. Tomorrow it is home again. This may be our last RV trip. (If you know anyone looking to buy and excellent small RV, let me know.) It won’t be our last fishing trip, though. "Thor" is officially up for sale, with postings on FaceBook, FB's Marketplace, Nextdoor Neighbors, Craigslist, RVT.com and RVTrader.com. But until it is sold, we will continue to use it. 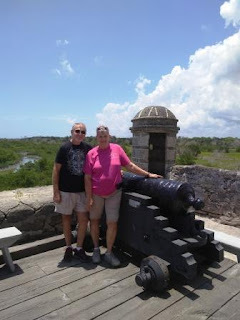 So, here we are--at Faver-Dykes State Park, which is about an hour south of our house (30 minutes south of St. Augustine, Fl.). This is a huge state park with more than 6,000 acres available for hiking, camping, fishing, boating, canoeing, and kayaking. Wildlife abounds.Our first wildlife encounter was a few minutes after setting up camp. Jim called me outside and pointed to the ground. We watched an insect crawl out of a hole, shake off the sand, tumble around, until it finally got itself together. Later we realized that it was a cicada. Since then, I have seen countless holes from which the cicadas have emerged, and at night, the trees hum with their mating calls. Unfortunately, we did not think to grab our camera phones and capture the "birthing" as it happened. Camping is slightly different for us, this time. We brought Molly along. Our neighbor asked if we could dog-sit while they went to New Jersey for 10 days. I love having Molly with us; it gives me my "dog fix." It's like being a grandparent: You can love and spoil them for a while, then give them back to their parents. Molly has never been camping before, but she is enjoying it. The first day was taxing for her; there was so much to see and so many new smells! She was so excited she never took a nap. Needless to say, she slept like a baby. 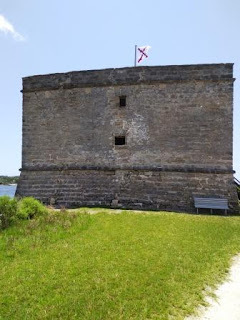 Yesterday, Jim and I explored the area and decided to tour Fort Mantanzas, a Spanish fort that guarded the southern entrance into St. Augustine through the Mantanzas River. The fort is a National Monument. Surprisingly, there was no admission charge, even though tourists must take a boat to the actual fort, which was built in 1742. Now fully restored, it is an interesting relic of the past. 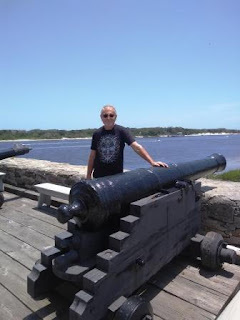 Some original cannon still guard the river against invaders. I was a bit concerned that Molly might bark when we left her during the day, but that did not happen. She is not much of a yapper. I think she was grateful we had left for awhile so she could rest. 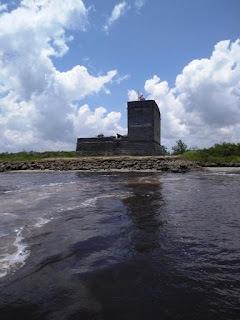 Jim and I intend to go fishing, both in Pellicer Creek (not a creek like we have up north; it is like a river) and in the surf. All good things must come to an end. Jim and I have enjoyed RVing since 2010, when we bought our first motorhome, a 38-foot, 1998 Newmar Dutch Star. 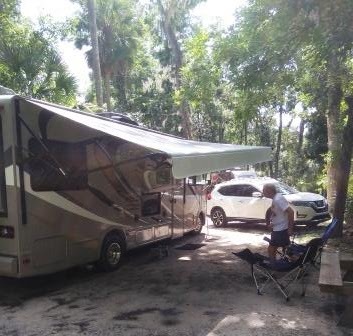 Its successor was newer (a 2007 Country Coach), larger (40 feet), and more comfortable (three slides), but when it began to feel its old age, we decided to trade it in and at the same time, trade down to a smaller sized RV—a 2016 Thor Axis 25.2. Now we have decided it is time to say good-bye to Thor; it is for sale. Thor is a member of a new and highly coveted generation of RVs called an RUV—a recreation utility vehicle. What exactly is an RUV? Well, think of an RUV as a compact Class A motorhome: It is compact in size but offers all the amenities of a full-sized motorhome for less cost and easier accommodation. We have truly enjoyed “Thor.” But, life has a way of going on, and sometimes it cannot accommodate traveling by way of an RV. So, we have decided it is time to say good-bye to Thor and to RVing. Thor is a great RV, especially well-suited for a small family or a couple. We have experienced no mechanical or electrical or plumbing problems with it. We want it to go to a good home where it will be loved and used as we have done. I can see it carting the kids to weekend sporting events (soccer, tennis, gymnastics, skating?). Or, perhaps going on spontaneous short vacations, camping in either resorts with amenities or in nature at state parks. 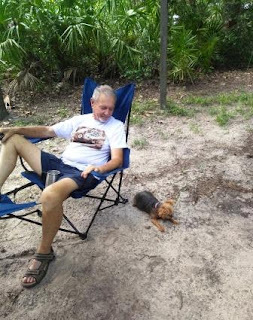 Thor’s smaller size makes it easy to set up camp in some of Florida’s older parks or in coveted areas such as oceanside at Gamble Rogers State Park in Flagler Beach, Fla.
· Short enough to park in most driveways. This RUV only has 9,200 miles on the odometer, and 367 hours on the generator. We are asking $69,900. If you are interested in seeing Thor and test driving it or just want to know more about its many features, please give us a call. Or, perhaps you know someone who is thinking about buying an RV. Please spread the word! Our number is (904) 821-8031. We are located in Jacksonville, Fla.